New Winter 2018: Swarovski crystals highlight this beautiful creation from artist Teresa Thibault that makes a memorable gift for friends celebrating the birth of a son during the past year. 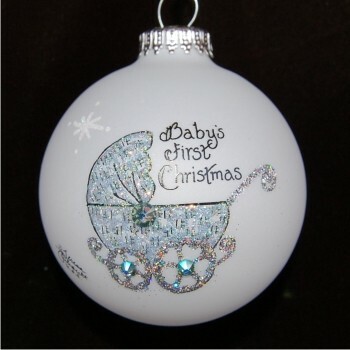 The crystal celebrations baby boy buggy personalized Christmas ornament is completed with your congratulatory message. This handcrafted piece of the highest quality is one of our popular ornaments for baby boy personalized for the joyful parents or grandparents. The crystal celebrations baby boy buggy glass Christmas ornament is shipped in a custom gift box.